There's lots been happening at Khargo: Tip Jars. First, we updated our tip jar scripts to include a feature many people have asked for - the ability to adjust the floating text above the Tip Jar to reflect it's use. So if it's being used as a split percentage - maybe for a duo - then it could be called Ke & Sel's Tip Jar (as an example) or for a venue - My Wish Tip Jar. We've added a lot of new tip jars to our standard range - from a simple sculpted "Tip Jar" to a very cute voodoo doll and many different styles in between - check out the slide show for the new additions or see the complete Standard Range at our Flickr, our in world store - Khargo: Tip Jars or on Xstreet. 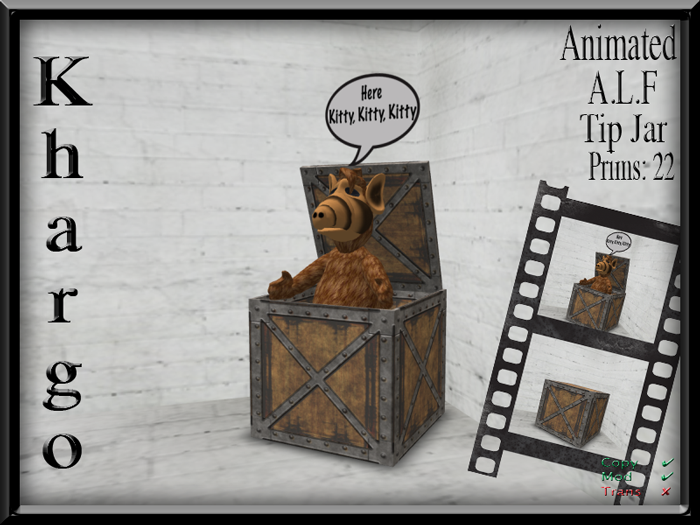 Our tip jars are probably the most advanced and most original you can find on in SL and are really easy to configure through a simple notecard. Finally, we've also been making some custom Tip Boards for artists including Skye Galaxy, Gina Stella, Arturo Martinsyde and Anek Fuchs - look out for them at their gigs around SL. For your own Custom Tip Board contact Keanu Kharg to discuss your requirements.